My hair is very important to me (and my career), so when I find products that keep it moisturized and healthy I have to spread the word. My husband always nags me for using products once or twice and then abandoning them in the medicine cabinet when I am not thrilled with the results. But when I discover something I love, I finish the bottle. 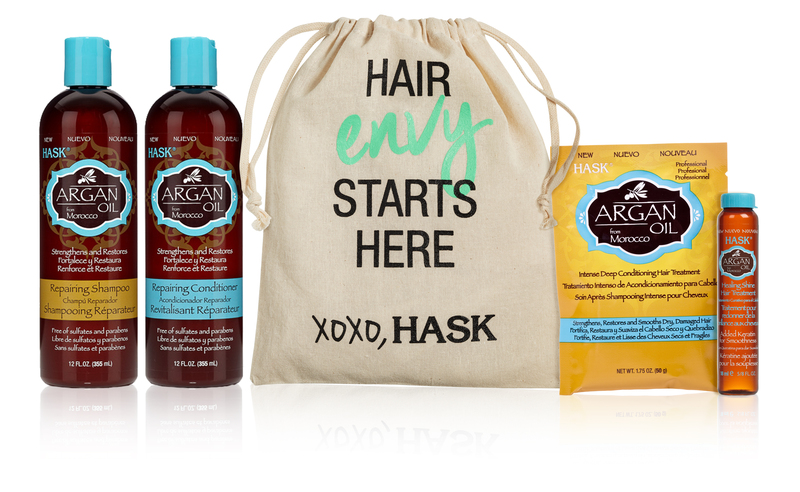 I recently tried Hask Argan Oil Shampoo and Conditioner and was so impressed with the results. The first thing I noticed when using Hask Argan Oil shampoo was the citrus scent, which was pleasant and not overpowering. Since I have such thick hair I wash it in 2 sections, and a generous squeeze was more that enough for each. The sulfate free shampoo left my hair feeling clean but not striped of all its natural oils. The Hask Repairing conditioner is very moisturizing and the Argan oil made my hair very smooth while not weighing it down. I again apply it in sections and using a wide tooth comb, go through my entire head to ensure that the product is distributed evenly. After letting it set for about 5 mins I rinsed it out and my hair was left feeling so soft which made blow drying effortless. I am so impressed with the salon quality of Hask Argan Oil, they will be my go to products to keep my hair so looking its best all winter long!